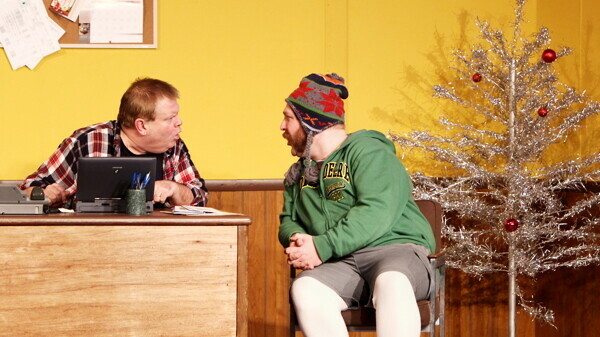 “I TOLD YOU NOT TO PUT TOO MUCH GLITTER ON THE TREE!” The locally produced and written comedy Mr. Christmas runs at Fanny Hill through January 13. When you think of a Christmas show, you normally think of the same boring play put on every year… not an exciting comedy that will give you a good chuckle and really get you in the spirit. In Mr. Christmas, Rudy starts a delivery service and is having a hard in the economy when all the sudden this “kind of odd guy” walks in and says he has a job for Rudy. The guy turns out to be one of Santa’s elves telling Rudy that Santa had an accident and they’re looking for a replacement to deliver toys and play Santa. The play follows Rudy on his journey of discovering what he is capable of and how an average guy like Rudy can save Christmas. Although this could sound like a potential rough sell to adults, the show isn’t really geared towards children, although there aren’t any dirty jokes that might keep them away, the purpose of the show is mainly for entertainment for all ages. Hodgins adds, “You just have to buy into the magic of the season and enjoy the comedy for comedy’s sake.” Most adults leave with a smile on their face and holiday spirits in their hearts, while there are some fun things for kids to get into, such as Santa’s bottomless bag and his journey through chimneys. “What people have said coming out is that it really got them into the mood and the spirit of the season. It’s becoming more difficult to get into the holiday with our stressed out lifestyles. Sit back, relax, and enjoy. Just accept this reality for the time being … the warm, fuzzy holiday feeling” says Hodgins. Other main characters in the show include Marsha, Rudy’s wife, played by Christine Finn and Wally played by Mike Cook, who has participated in over 50 shows at Fanny Hill. Mr. Christmas will be playing weekday matinees on select days that you must call ahead for reservations. For matinees, dinner will be served at noon with show time at 1:45pm. Prices for the matinee are $43.99 for dinner and the show and $34.99 for just the show. Sunday Brunch matinees are also offered with seating from 11:30am - 12:30pm and show time at 1:45pm ($43.99). Thursday through Saturday, dinner seating is from 5:45pm - 7pm with show time at 8:00pm. Prices for Thursday are $46.99 for dinner and the show and $34.99 for just the show. Friday and Saturday night prices are $49.99 for dinner and the show and $34.99 for just the show. Discounts are available also for groups and children. Also for students, show tickets are discounted down to $14.99. As Lois Hodgins, Don’s wife adds, this would make a perfect date night. 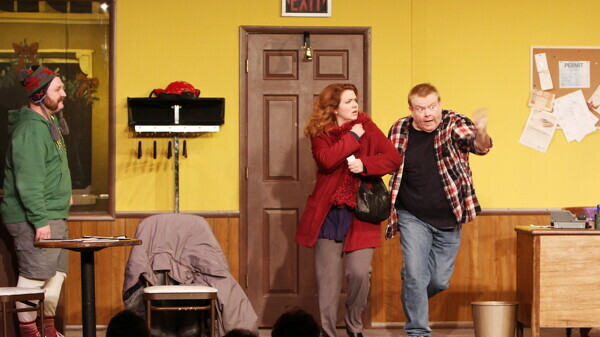 Or just a fun excuse to see a hilarious play with beloved characters and true holiday spirit. Mr. Christmas runs at Fanny Hill until January 13, 2013. For more details, go to FannyHill.com.